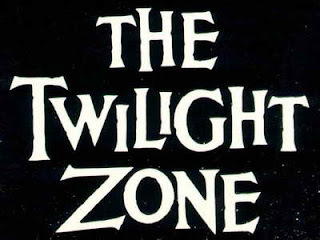 Every year, Syfy presents it's annual Twilight Zone marathon. And every year, the show proves how timeless it is, with its mostly black and white productions and simple effects. It's truly a wonderful classic that we're lucky Rod Serling came up with. Syfy said that fan-favorite episodes will be aired during prime time. Twilight Zone products on Amazon. Did you know that without looking it up, you can tell what year an episode was made, just by the words in the introduction that Rod Serling delivers? "There is a fifth dimension, beyond that which is known to man." "You're traveling through another dimension, a dimension not only of sight and sound but of mind" and includes "That's the signpost up ahead" in the words. In 1961-62, the signpost statement is gone. In 1963 (the fourth season), the intro starts out with, "You unlock this door with the key of imagination." Regardless of the year or season, there are some great episodes, and in addition, you can see the stars of today, so young and just beginning their careers in the entertainment industry. Through all the shows, you'd catch such young talent as Bill Bixby, Charles Bronson, Robert Duvall, Ron Howard, Martin Landau, Cloris Leachman, Julie Newmar, Leonard Nimoy, Robert Redford, Burt Reynolds, Jonathan Winters and so many more. The series is like a wonderful tribute or time capsule to some of these great actors and their careers. One of my favorite episodes is from season 5, with "Nightmare at 20,000 Feet," starring William Shatner. In case you're wondering, the word 'The' is and isn't in the title of the series. 'The' was part of the title until CBS pulled the word out of the title for the fourth and fifth seasons.